One of the exciting features of HTML5 is the promise of universally supported animation and graphics via the new canvas element/tag. In this post, I look at how easy it is to use this tag with a simple example. I also demonstrate how well it is supported in five major web browsers. 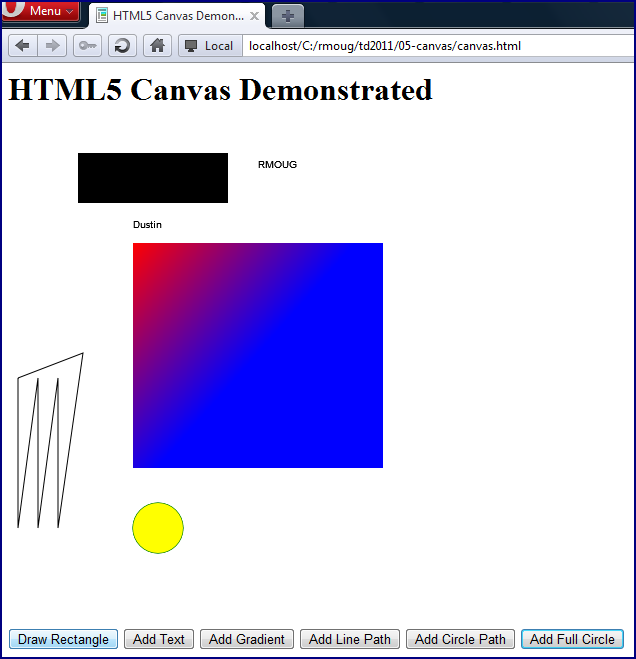 The above example allows the user to click on a button at a time to see each different item drawn to the canvas. Rather than show each step here, I show the final result of pressing all buttons as rendered in Chrome 8, Firefox 3.6, Opera 11, and Safari 5. Internet Explorer 8 is covered separately later in the post. 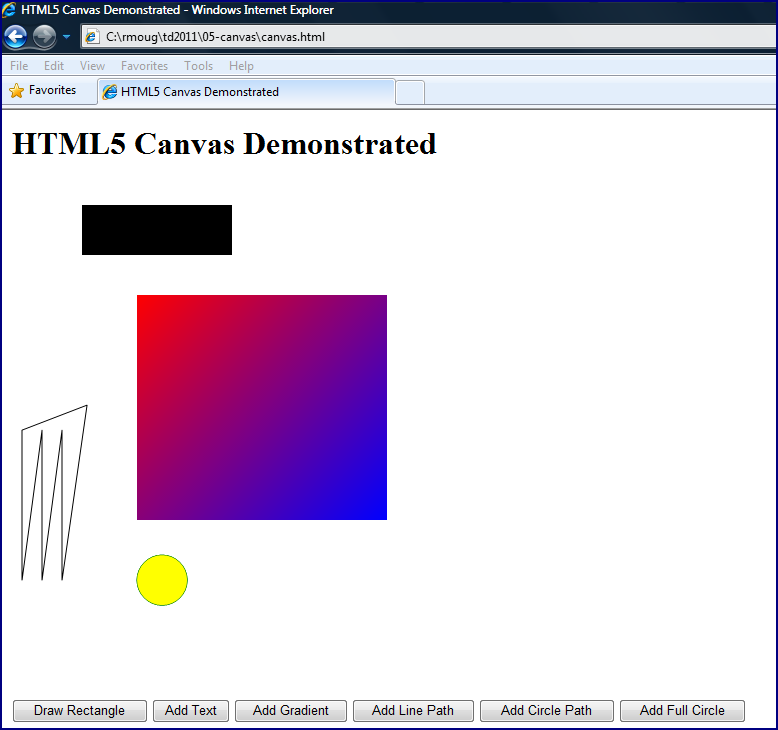 Unfortunately, as the next image shows, Internet Explorer 8 does not render the above example as well as the others. 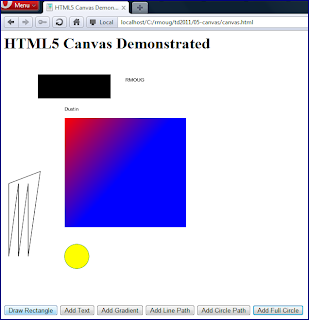 The license for explorercanvas is Apache License 2.0, its downloaded ZIP file is less than 100 KB in size, and the Instructions wiki page demonstrates how easy it is to use. When I add this to the HTML shown at the beginning of this post and reload the page in Internet Explorer 8, it (mostly) works! The newly rendered page taking advantage of explorercanvas is shown next. 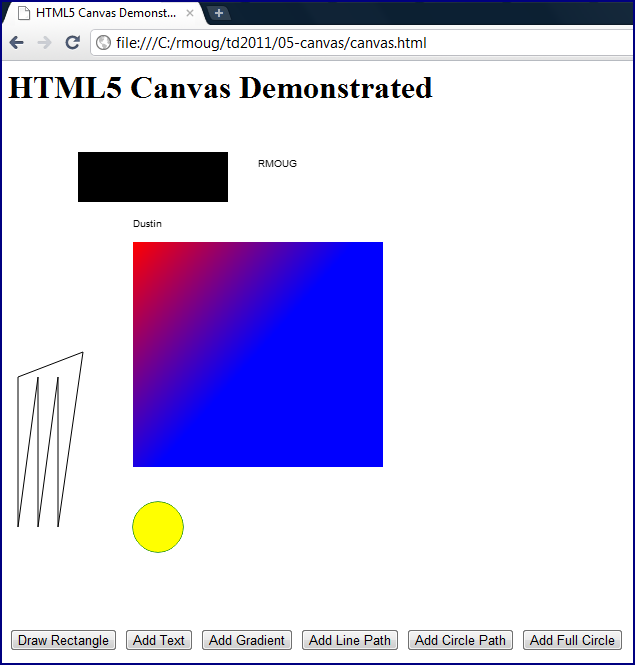 The canvas text does not seem to work (no "RMOUG" or "Dustin" strings), but everything else appears to behave in Internet Explorer 8 thanks to explorercanvas. 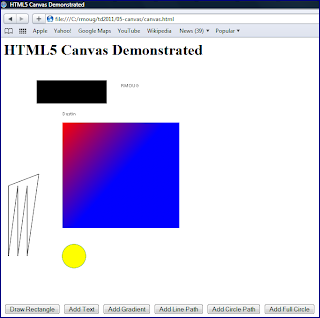 The HTML5 <canvas> is one of the more consistently supported HTML5 features across the major browsers. Thanks to explorercanvas, even Internet Explorer 8 can largely support it. 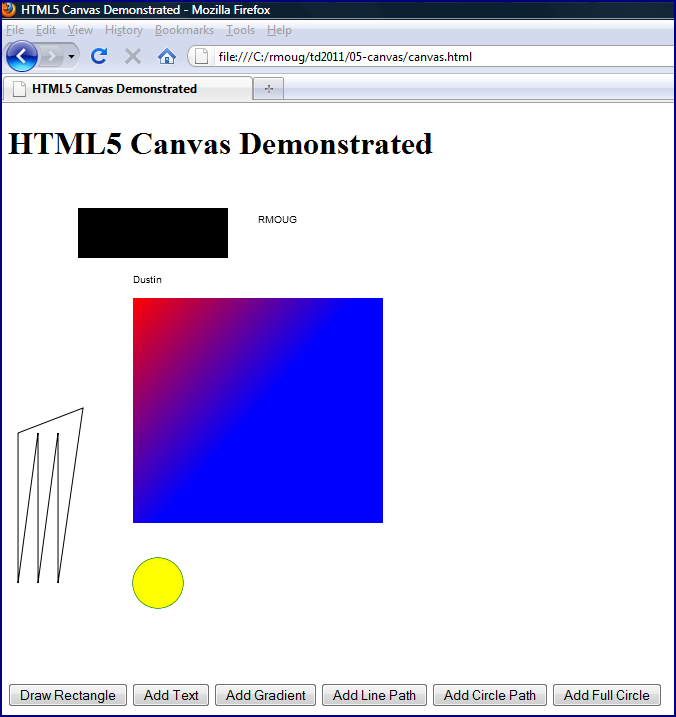 Besides being standard and consistent, the <canvas> functionality is easy to apply.